The Durga Puja festival is just around the corner. This is one of the most important festivals of West Bengal and it is celebrated with equal zest throughout India. It is a time to thank Goddess Durga for all the love that she showers on her children. It is time to celebrate the victory of good over evil. One of the most important aspects of any Indian festival is spreading happiness among family and friends. Durga Puja is not any different. 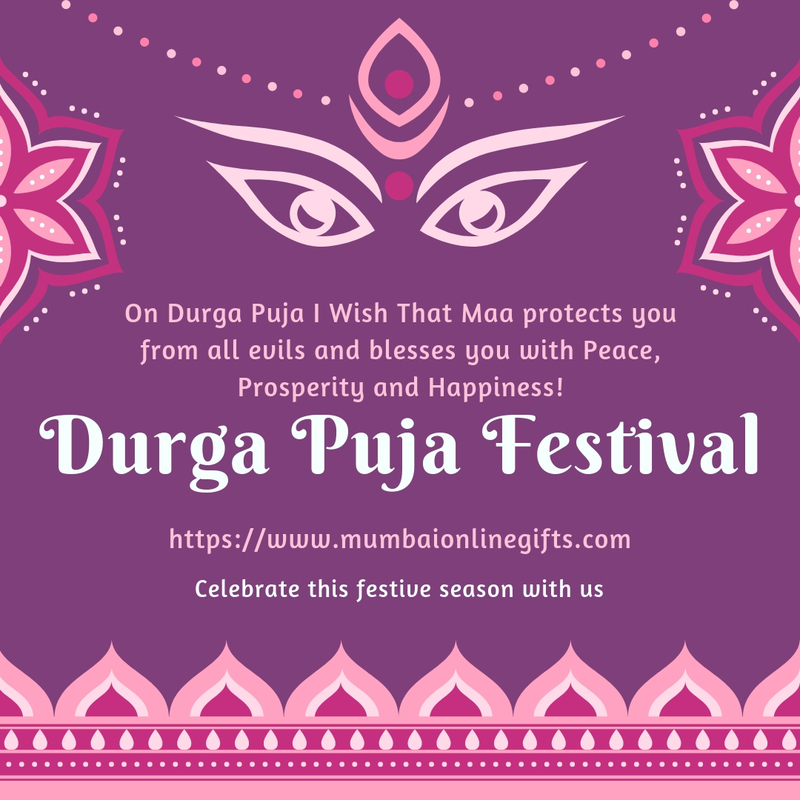 You can send Durga Puja gifts to Mumbai loved ones on this special occasion. Here are some special gift ideas on the occasion of Durga Puja. Indian festivals are incomplete without sweets. Some of the best sweets for Durga Puja are Ros gullas and special dry fruit sweets like kaju katli etc. It will truly bring a smile on the faces of your loved ones when they get such special sweets on a special occasion like Durga Puja. The options for Indian sweets are endless. All that you must know is what your near and dear ones relish the most. Any Indian festival is incomplete without flowers. So if you send special flowers as gifts for this Puja festival then nothing like it. You will find that good online stores have special flower arrangements of different flowers. Since marigold and mango leaves have special significance in important Indian festivals you will find that there are some stores which have special flower arrangements that have marigold flowers and mango leaves. There are other flowers as well like roses, jasmine, orchids etc. What is that one thing that any family member or friend will surely love getting as gifts? Yes, you are right! A miniature idol of Goddess Durga is one of the most priceless gifts that your loved ones can get on the occasion of Durga Puja. This is the time to pray to the Goddess. So your loved ones will need the special Puja thali which has sibndoor, necklace, diya and all the other things that are needed to pray to the Goddess. There are some online stores which have such special Puja thalis. If you want to buy a gift for your mother or any other important lady in your life then you must opt for a special saree which she can adorn on the occasion of Durga Puja. For a modern touch to Puja time, you can opt for options of cakes of different varieties or even chocolate hampers for loved ones. If you want to send something rich then you can select from boxes and hampers of different dry fruits. In order to make sure that your loved ones get the best quality gifts in time make sure that you opt for the best online gift store.